Teaching your child to ride a bike is one of the parenting milestones that you’re probably looking forward to. Having your child start out on a balance bike will make the process a lot quicker and easier. A balance bike is a two-wheeled bike that does not have pedals and mainly teaches your child how to balance. Children as young as eighteen months can enjoy using a balance bike. In fact, once they master balancing they should have the skills to skip over training wheels and go straight to a regular bike. Check out our list of the ten best balance bikes to officially begin your child’s bike riding journey. Balance bikes are a wonderful way to get your active little one outdoors. These bikes help promote an active, healthy lifestyle early on. 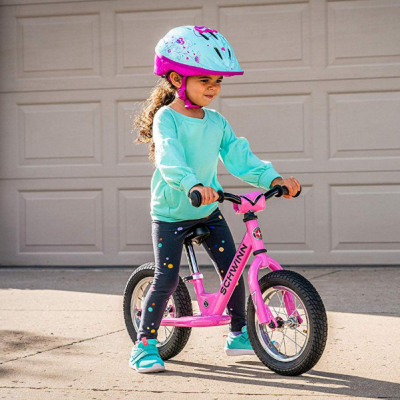 We made sure our top ten list of these balance bikes were still available and had the highest rating that 2019 had to offer. We also converted this buying guide to our new format. Forget those training wheels and help your kid to learn to ride a bike earlier and easier. This bike has been designed with no pedals giving your child the best way to develop the best balance skills possible plus it even develops their coordination and steering skills. All of the materials used to construct this bike are environmentally friendly and non-toxic. The metal parts of the bike are made out of anti-rust carbon steel. The seat and handlebars are adjustable making it easy for their feet and arms to reach everything to make them a successful rider. Learning the skill of balance is not only a great way to develop gross motor skills, but it is a great form of exercise. Incorporating exercise at a young early into your child’s daily routine while providing them with benefits throughout their lives. It is not only healthy for them physically but is proven to help with mental health as well. These tires is made out of an EVA Foam that is puncture resistant. That means never having to pump them up and they provide a super stable and smooth ride. 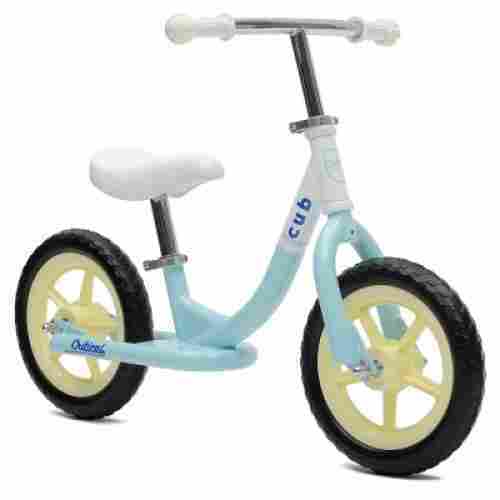 Weighing in at 5.9 pounds this balance bike is super lightweight yet supports up to 110 pounds. This is an ideal bike to start their bike training with no worries from the parents. The lightweight design of this balance bike makes it easy for younger kids to ride on many different surfaces. They are able to ride on the grass and also easily inside on the carpet. Radio Flyer has been around for 100 years, creating toys that are beautifully simple and extremely safe. 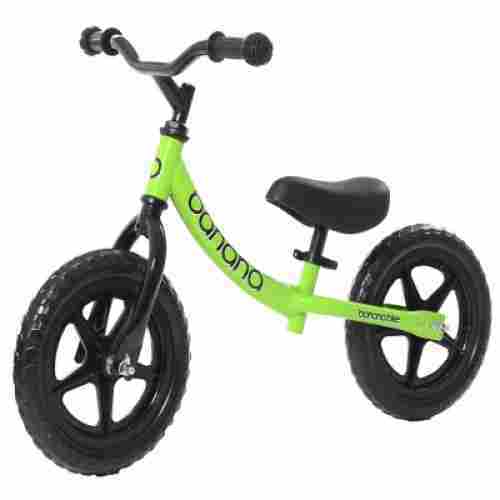 This balance bike is a pedal-free, lightweight steel bike frame with 12-inch air tires that ensure smooth riding. The seat is cushioned for comfort, so little ones can sit for longer periods of time while they practice, and the seat is adjustable to fit your child’s growing needs. Its sleek, classic red design will have your child excited to ride in no time at all, and its durable build can withstand some bumps and crashes along the way. Just don’t forget the helmet! The hand grips are soft and plush, and a functional ringing bell adds a fun touch. The Radio Flyer Glide and Go is most suitable for children who are between the ages of 2.5 and 5 years, and at or beneath the 50-pound weight capacity. It’s sleek, safe, and stable. This bike will last you a while, and since its adjustable, your child won’t outgrow it for some time to come. It’s comfortable and it will equip them with all the right skills to transition smoothly into riding a big kid bike. 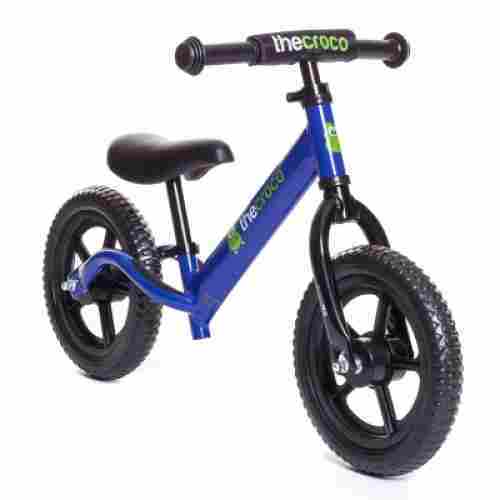 Weighing just 4.3 pounds, the Croco Premium is the lightest balance bike on the market. The secret to this feat is their EVA polymer tires and quality aluminum frame, which makes the bike durable but keeps it from being heavy. 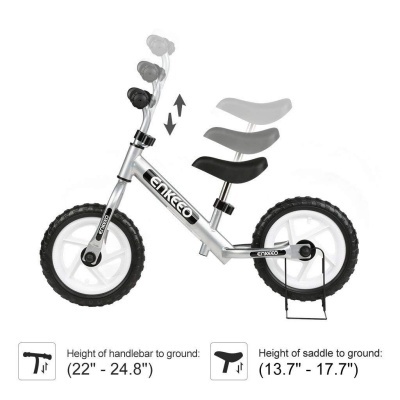 Its seat adjusts from 11.5 inches to 18.5 inches off the ground, and the handlebars can separate an extra 5 inches as well, as growing children’s arm span increases. 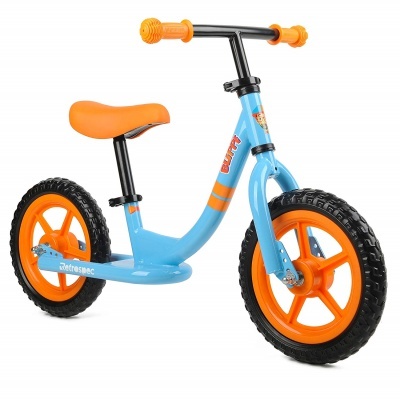 This bike is most suitable for children ages 18 months to 5 years, and comes with extra-soft handle grips, a padded seat, and gripped footrests. All screws are equipped with safety ends to ensure soft little skin doesn’t snag. Assembly takes roughly five minutes and is tool-free. Quick-release clamps mean that even when you adjust it for your growing boys and girls, there’s no need to break out the toolbox. A 100-percent satisfaction guarantee ensures that if you have any issues, Croco will cover you and replace all defective parts. If you’re tired of doing extra reps every time your child needs you to lug around one of their toys, this is the bike for you. It’s incredibly light--so much so that children can carry it themselves, and yet the safety and strength of the product isn’t compromised by this. Croco has a great design here, made for comfort and a consistently good performance. An adjustable seat and handlebars mean that your child will be able to use this for quite some time. Although it is extremely lightweight, it also is extremely durable. Its tires are made from EVA polymer, which is integral to keeping the bike at a mere 4.3 pounds. The Strider 12 Sport balance bike is loaded with goodies that will make the process of learning to balance more than enjoyable for your child. Children as young as one can experience the fun of balancing and with the adjustable seat they can continue to experience the fun as they grow. 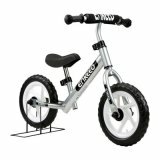 This bike is available in a variety of different colors, thus making it easy to pick out the perfect one for your child. With the very simplistic design of this 12 Sport Balance Bike by Strider, young inexperienced kids can learn how to balance a bike. The customized toddler grips make it easy for your child’s little hands to grasp and control the bike. The padded handlebar and seat will provide a comfortable experience. This helpful bike does not have any type of complicated features which will go a long way towards making kids feel confident as they learn to ride a bike. With ten years of experience under Strider’s belt, it should be no surprise that another Strider bike made our list. Adjusting the handlebars and seat is super easy as the bike is designed with a quick release. At 11 inches, this is one of the lowest seat heights found in balance bikes. 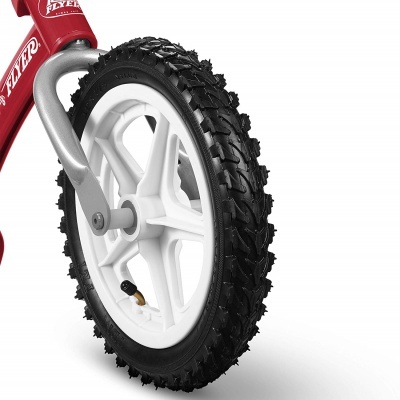 The foam wheels allow your child to get the bike rolling quickly. 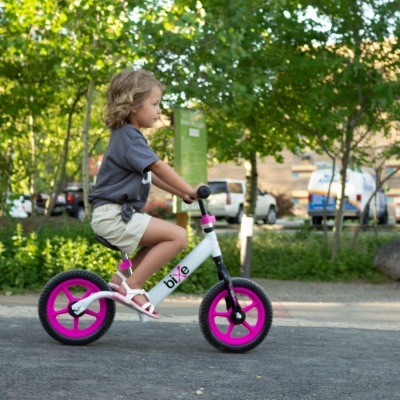 In fact, the foam material makes it easy for your child to push the bike over a variety of terrains. Transporting the bike is super easy as it can quickly be taken apart and put back together. 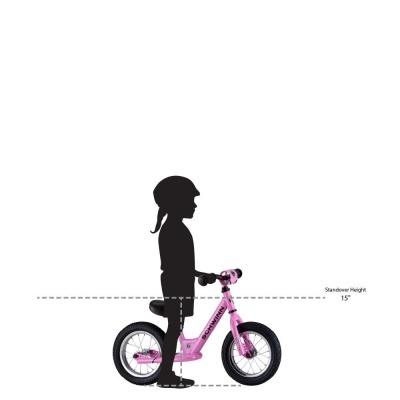 Young children can easily maneuver the bike as it only weighs 6.7 pounds. 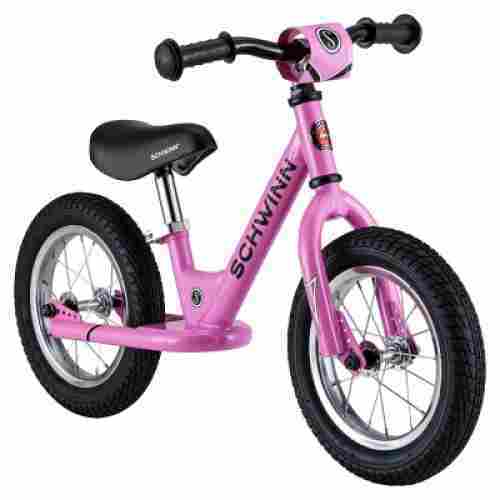 Available in pink, red, blue, or green you can purchase this bike in your child’s favorite color. The 12 Classic is specifically designed to aid young kids in smoothly transitioning from taking decisive steps while sitting on a seat, to acquiring the knowledge of guiding and balancing a bike. Similar to Strider’s 12 Sport Balance Bike, the Classic version can help unseasoned kids to develop a strong foundation in balancing a bike. Kids will feel confident in being able to easily pilot this Strider bike as the seat is adjustable to help with comfort and the grips are custom made specifically for small hands. This lightweight bike comes with built-in footrests to further aid your child in balancing as they are able to coast and glide with them. The first time we laid our eyes on the Cub No-Pedal Balance Bike for Kids, we thought it was a scooter with an integrated seat. The reason for this was the unusually sleek profile of the Cub but with an extra-large footrest platform at the base of the frame and the seat. The only thing that really gives it away as a unique glider bike is the two wheels that are too large to be considered a scooter. Regardless, the Cub is one fascinating ride for young tots as the comfy seat naturally conforms to the still-developing hips and pelvis of growing children. The seat, as well as the handlebar, are fully adjustable, too. You don’t actually need any special tools to do this. Moreover, the adjustability of both components is just perfect for growing children. The wide footrests are a joy to behold as they provide added security and safety for your kid’s fragile feet. This helps provide greater stability as your kid can easily rest his or her feet on these structures instead of letting them dangle on the sides. The unitary design melding the seat structure, the frame, and the rear wheel fork adds to the stability of the Cub. Adding to this safety and stability is the step-thru design of its bike frame. It’s like the frame of ladies’ bicycles allowing them to easily hop onto the seat. This minimizes the risk of falls especially if your kid’s motor development is not yet that fully advanced. The Cub’s sleek and curvy appeal be trays the functionality of its overall design. What is truly amazing about the Cub is its wide footrests as well as spectacular step-thru frame. The tires are fully rubberized, too, and as such, you don’t have to worry about tire punctures and blowouts. This should spell an added benefit in the form of low maintenance requirements. For the fact that there are no pedals on this bike, kids can receive a better balance, therefore, decreasing the falls. 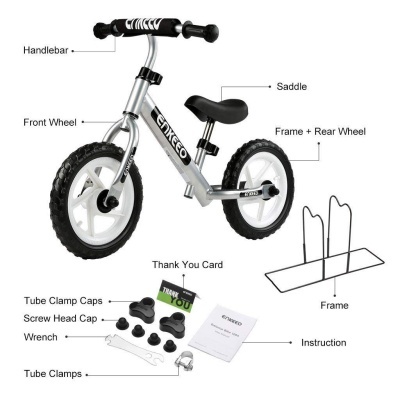 Your child will enjoy the high-quality frame on this bike as it is virtually indestructible so that it will last them until they acquire enough stability and confidence to control a bike with pedals. The footrest is very low to the ground, so whenever your kid feels uneasy, they can stop comfortably. This amazing bike by Critical Cycles has a very low risk of injury and minimal assembly so that your kid can start striding and gliding right away. Learning to ride a pedal bike is not nearly as challenging after kids have learned to ride a balance bike. This balance bike has a unique body design that is practical and simple. The simple and unique design of this frame on the balance bike is great for young riders. It is easily adjustable to their height and makes it ideal for them to learn quickly. which is great for outside riding or on rough terrain. The simple design of this balance offers everything that a great balance bike needs and would be great to add to your outside play toy collection. Learning to balance on a pedal bike can often be difficult, but with this balance bike, it takes away the pedaling and just focuses on the balance. Children who learn to ride a balance bike are shown to have considerable improvements in their bilateral coordination. The design is great for getting just the right height with the body to the floor. With adjustable seat height, it makes it easy for kids to feel comfortable pushing and gliding along. This allows them to practice balancing a bike without having to worry about the pedal aspect. Adjusting the handlebars to just the right position also adds to their confidence. Allowing kids to learn to ride a balance bike before riding on a pedal bike is a great way to promote their balancing capabilities. It is one of the most important skills that are needed. 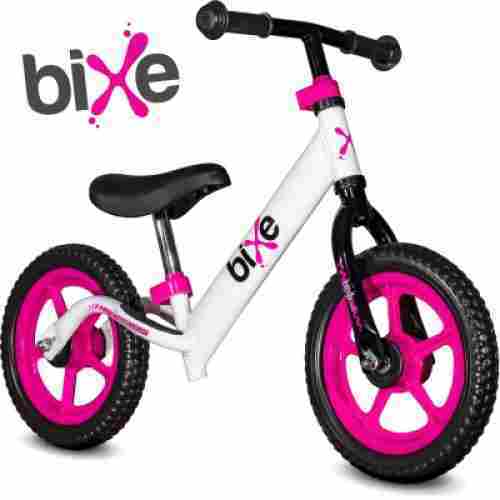 The Bixe will swap out any fears your little one has with learning to ride a bike and replace it with excitement. Designed with an all-aluminum frame, this 12-inch bike is extremely lightweight. Weighing in at only four pounds, your toddler can feel a sense of control as they have the ability to carry their own bike. Introducing your child to a balance bike before a bike with training wheels will make the process of learning to ride a bike quick and easy. The seat and the handlebars are designed to just thus allowing your child to continue to use this bike as they grow. When purchasing you can choose between several fun colors to match your child’s style. Your child can safely plant their feet down as soon as they begin to feel as if they are losing their balance. As their ability to balance increases so will their confidence. Assembly is simple, thus your child can begin balancing in no time. Designing the bike to be light enough for a toddler to carry is absolutely amazing as it will reduce your child’s fears and make them feel more in control. The bike is easy to use, thus your child will have no trouble with grasping the concept of walking with their bike between their legs. We know how frustrating it can be to teach young kids how to ride a bike. There’s simply a lot of things that need to be considered such as your kid’s ability to balance. 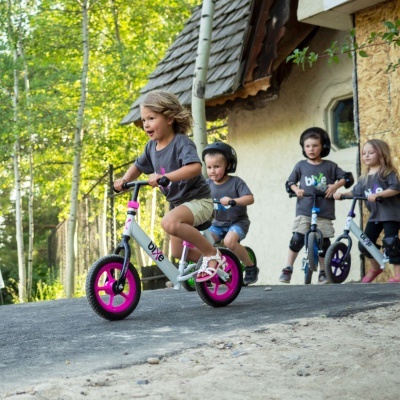 While some may prefer a tricycle, many prefer a no pedal bike such as the KaZAM Classic Balance Bike. This is one truly revolutionary training bicycle technology is one of the most preferred by many parents wanting to teach their kids the intricate art of balancing. And it’s very easy to understand why. This is one feature that is well-received by many parents as it does provide for a more comfortable ride. This is not to say that there are no detractors as well, especially those who are concerned about the tires getting punctured and needing remediation. Well, it’s all about your personal preferences whether you are more concerned about riding comfort or about the ease of its maintenance. Adding comfort to the riding experience are the grip handles that have been beautifully wrapped in soft and cushiony padding. But if there’s one thing that is truly captivating in the KaZAM Classic no pedal bike, that would be its super sleek designer frame. The frame of this glider bike can be best described as a letter “S” that has been turned on its side. So you can just imagine the sexiness of the curves of the KaZAM Classic. The fully integrated footrest is located in the inner curve of the bike frame, unlike the usual arrangement located on the rear fork. This arrangement allows for optimum comfort riding as your kid will be able to put his or her feet directly in front of him or her and not towards the side and back. It is thus, no wonder why a lot of people actually love the KaZAM Classic. And we simply cannot say otherwise. The overall design of the KaZAM Classic is truly a marvel, to say the least. The placement of the footrest is one of the main reasons why we chose this over the others. Plus, the other features like a fully adjustable handlebar and seat make this a true gem to have for your children. 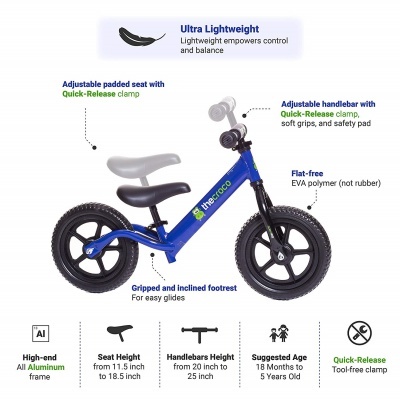 The KaZAM Classic Balance Bike has a good build in addition to being compact and lightweight so that it is easy for you to place into your trunk without any hassle if your kid would like to ride at the local park. In contrast to the no pedal bikes listed above, this classic balance bike has inflatable tires. The inflatable tires will benefit your child greatly as you can decide how much air will be able to help them balance better. The KaZAM Classic has plenty of features that are designed to make your kid’s training a lot safer, more comfortable, and truly easy. 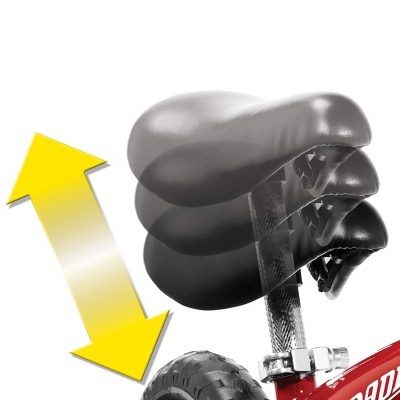 The molded seat, for instance, allow for superb riding comfort which is further enhanced by its fully pneumatic tires. The more you inflate the tires, the faster the bike will go, in view of the fact that deflating the tires will cause the bike to move at a slower pace which is excellent if your kid is a beginner. 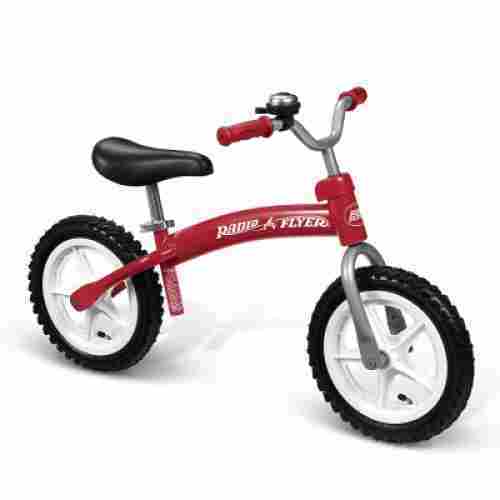 With the new and improved design of this balance bike, you won’t be let down. The seat and bearings have been updated plus they have added; quick release bracket on the seat, made the metal headset stronger, upgraded the handlebars, and it is now easier than ever to assemble. 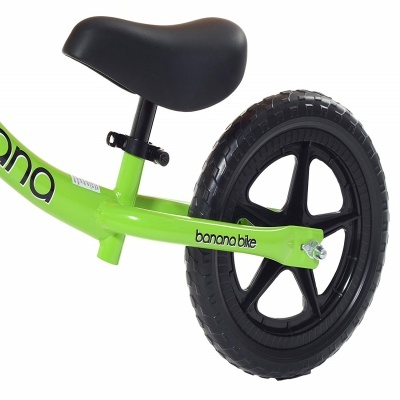 One cool factor about this balance bike is the banana-shaped frame design which is great for toddlers 18 months or older. Save money and your children’s knees as well. It is thought in the past that balance bikes were just a waste of money, but they are proving everyone wrong. Balance bikes actually replace all the tricycles and small ride on toys that kids usually get plus they can ride their balance bike for a much longer period of time making it a great decision overall. Their overall balance skills will be better causing fewer wrecks once moving to a pedal bike. So buying a balance bike it is a win for all. The tires feature a puncture proof foam that has been constructed from EVA foam. Not only will they never get a flat, but you will never have to pump them up either. This is a great bike with a classic design that is sure to impress. In picking a product to include in our list of the most amazing balance bikes, we had to look at the safety first. This is because these ride-on toys are technically replacements for training wheels and tricycles that many young kids use. However, since they don’t have pedals or any mechanism other than a frame, a steering handle, and two wheels, their safety is one of the utmost concerns. In ensuring the safety of these kinds of bicycles, we looked at their overall construction. It must be highly durable, otherwise, you’d be expecting a lot of wipeouts from your young rider. The safety features can come in different forms, though. Learning how to properly balance a bike can be a major accomplishment for any person, especially young kids. 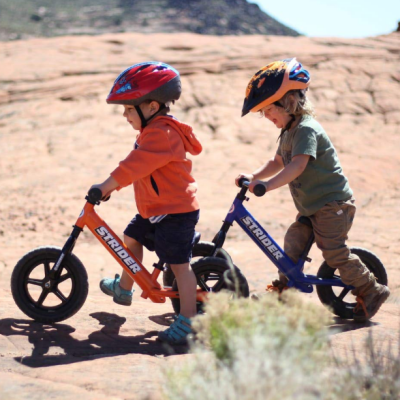 In view of the fact that kids can easily navigate and operate the specific balance bikes on our list, they will be confident as they are able to master the mechanical aspects of riding a bike such as steering and balancing. With the new-found confidence that kids may be able to obtain from balancing a bike, they may be able to transition to a bike with pedals with ease. It was also crucial for us to look at the different features integrated into the design and construction of the pedal-less bike. These can include the braking system, a turning limiter, the height of the seat, and any available footrests. The latter is actually for practical purposes especially if your kid is already cruising along pretty well with his or her glider bike. It would be awkward having his or her feet dangling on either side of the bicycle simply because he or she doesn’t have a structure with which to rest his or her feet. The weight of the balance bicycle had also been factored into the equation. Too heavy and the risk of falling because of poor balance and control is also great. Too light and one wrong move can send the bicycle up into the air like E.T. All of these features were cross-referenced with the developmental needs of children at a specific age. We had to make sure that the recommended age matches the developmental level of the child riding it. Otherwise, any mismatch can have implications to the young rider’s overall development. In general, balance bicycles serve to develop or train a kid’s sense of balance which should be the springboard for improving the kid’s coordination and confidence. If the ride-on toy cannot guarantee this basic developmental need, then we had to scrap it off our list. The bicycle maker’s reputation was also scrutinized. As much as possible, we only included those with an excellent reputation as it somehow speaks of the quality workmanship and safety that they put in every product that they manufacture. If we can establish their credibility, then we can be sure it’s a high-quality product. Learning to ride a bicycle is a rite of passage for every kid. The scrapes, the wobbly training wheels, and the nervous moms and dads running after their kid as he or she attempts to balance the bicycle are all part of the learning process. That’s why many parents give their younger children a kiddie tricycle to help them make the successful transition into a two-wheeled ride-on toy. Unfortunately, evidence suggests that doing so does not really prepare the child to one very fundamental requirement of riding a bike: balancing. Riding a bicycle requires excellent proprioceptive senses as well as superb coordination of the different body parts to achieve balance. Regrettably, giving young children a tricycle with which to train to transition into bicycle riding does not help them learn the very basics of balancing simply because a trike has three wheels which make it a lot more stable than a two-wheeled ride-on toy. As such, when a tricycle-trained child moves onto a bicycle, the only thing he or she has learned is how to pedal and how to hold to the handlebar. Clearly, the most important element of all is missing-–balancing. It is for this reason that a balance bike is now regarded as a much better approach to teaching kids how to ride a bike without necessarily pedaling first. They are essentially taught how to achieve and maintain balance especially while the pedal-less bike is already moving. So, when these kids do get to ride a bicycle complete with a drivetrain, they are able to make the transition a lot more successfully without bruises, cuts, and scrapes. This leads to better confidence among kids and greater peace of mind for their parents. If you’re still wondering whether to ditch the trike for a balance bike, just ask yourself if you want your kid to learn how to ride a real bike a lot faster and safer. If your answer is yes, then you’d have to ditch the trike. These balance bikes are very safe as they are made from durable materials that will not break down over time. Balance bikes for kids are low to the ground and easily adjustable to suit the individual needs of your kid. 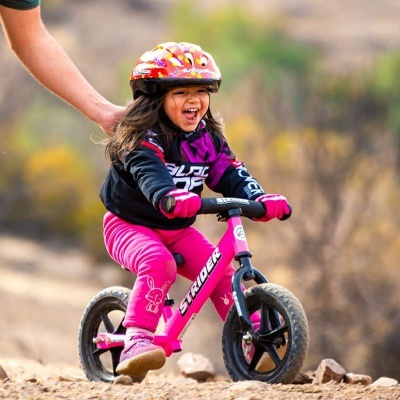 Because they don’t contain chain links or bulky pedals, which could result in injury, you can rest easy knowing that your kid will be safe as they operate this bike. However, it is important to remember that no bike will protect your kid 100 percent of the time no matter how well built it is, so always equip your kid with a helmet and other protective gear. Young kids love being able to do things on their own without the help of their parents for the fact that it makes them feel grown up if you will. 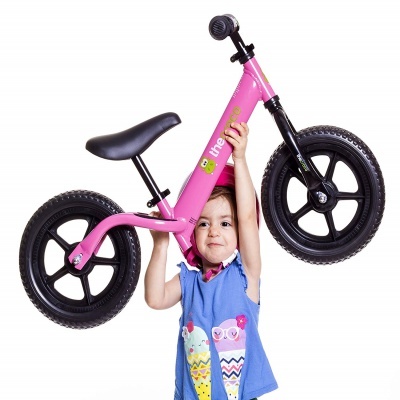 As kids are able to pick the lightweight balance bike up on their own and easily get on and off of it without help, they will feel more independent as well as confident when it comes to balancing and operating a bike properly. This feeling of independence will go a long way as your kid grows older and transitions to a bike with pedals. Kids are creative beings by nature. With these balance bikes, your kids will be able to pretend play that they are on a speed bike or motorcycle as they learn how to navigate the bike. Additionally, having an awesome balance bike will encourage your kid to interact with other kids in the neighborhood or at the local playground so that they can ride bikes together, creating many fun memories. 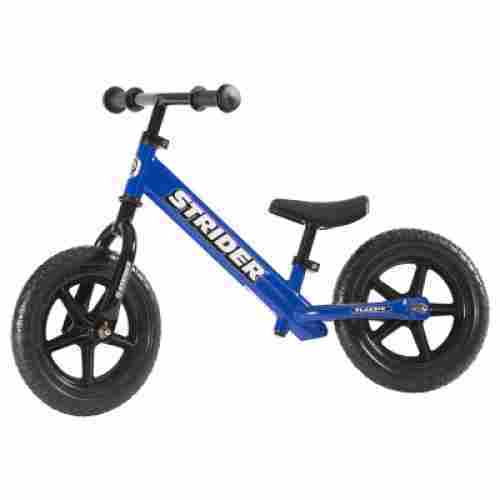 q: Are the tires of the 12 Sports Balance Bike by Strider made of rubber or plastic? The tires on all Strider bikes are made of high-quality industrial foam. Unlike plastic, this particular type of foam tire provides amazing traction, possibly much better traction than plastic tires. In view of the fact that the tires are filled with foam rather than air, they are 100 percent maintenance-free and you will never have to worry about your kid’s tire ever going flat. q: What are the benefits of bikes without pedals? Pedal-less bikes provide a variety of benefits for inexperienced kids. Kids can learn to operate bikes without pedals at a very young age, unlike traditional pedal bikes, giving them the advantage to learn sooner. Pedal-less bikes are very lightweight making it easy for little ones to navigate and handle. Pedal-less bikes also teach kids everything they need to know in order to ride a bike with pedals such as steering, balance and how to stop, all without bulky obstructing pedals or chains. q: Can I attach pedals to balance bikes? No, you cannot attach pedals to balance bikes as there is no way to efficiently do that because you would also need to integrate a chain-link system. Balance bikes are specifically designed without pedals so that your child may learn how to properly establish balance without the use of training wheels or pedals. Furthermore, the location of pedals could hinder your little one from learning how to properly balance a bike. q: Balance bikes seem very easy to navigate, does my kid still need a helmet? Yes, whether it’s a balance bike or a bike with pedals, your kid still needs to wear a helmet. No matter what type of bike your kid is operating, they will still be prone to minor accidents as all kids are and will need a helmet to protect them. In addition to a helmet, elbow and knee pads will be helpful as your kid learns how to balance and operate a bike.